An experiment led by scientists from James Cook University has shown that rising sea levels are a threat to the survival of sea turtles. 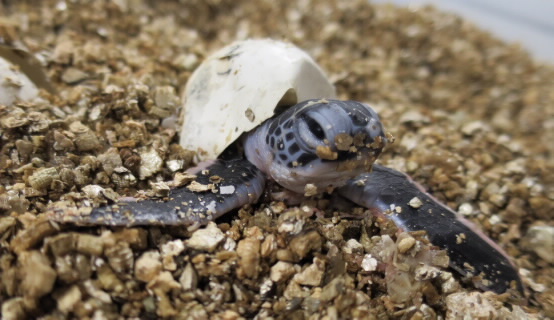 Researchers studied eggs from a turtle hatchery on Queensland’s Raine Island exposed to saltwater for different periods of time. Typically, female turtles lay their eggs in places that remain high and dry so that the eggs can hatch, but rising sea levels and storm surges can overwash nests incubating on the beach. Eggs that were inundated for one or three hours showed no significant level of mortality, but eggs that were underwater for six hours produced a 40% increase in turtle embryo deaths. Lead Researcher, Dr David Pike, said it meant that rising sea levels would impact on turtles well before the full effects of climate change were felt in most other places. Dr Pike said short of preventing sea-level changes, direct action could be taken to help prevent turtle eggs from being covered by water. Dr Pike said the larger mystery surrounding the continuing decline of Green Turtles on Raine Island remains to be solved, with inundation by seawater as well as other factors, possibly including high microbial levels and heavy metals in the soil, all probably playing a part.